Typical vinyl mesh fabric for sling chairs can often feel rigid and uncomfortable. Sunbrella Sling stands apart with a unique blend of strong PVC-coated polyester and soft Sunbrella acrylic material. 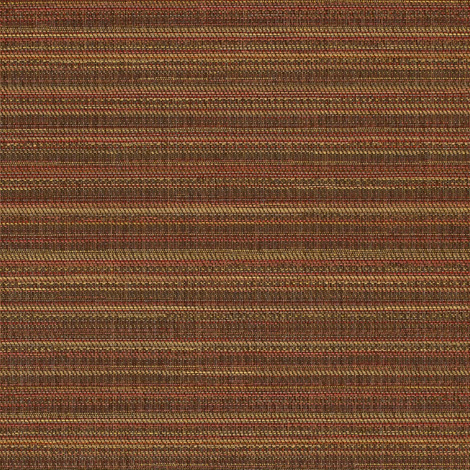 A meeting place for durability and comfort, the vinyl upholstery fabric material sets the tone for a new market standard. For added texture and luxury, the heavy-duty outdoor fabric combines natural color schemes with novelty threads. Subtle patterns help balance any décor or decorating fabric. The sling fabric resists stains, water, mildew, and fading for a modern designer look that's easily maintained. Sunbrella Sling in Weyburn Redwood (5910-0006) is optimal for replacement upholstery, custom-crafted patio furniture, and other sling applications. Shop the sling chair vinyl fabric by the yard. Warranty: 5 years. Width: 54 in. Weight: 14.7 osy.